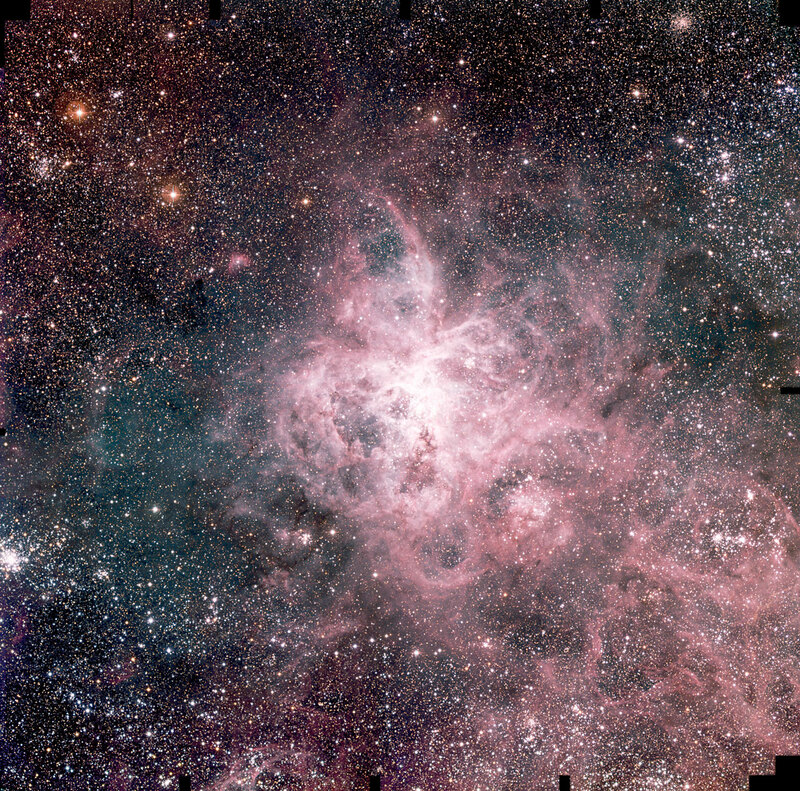 The largest emission nebula in the sky, the Tarantula Nebula (also known as NGC 2070 or 30 Doradus) is located in the Large Magellanic Cloud (LMC), one of the satellite galaxies to our own Milky Way system. Seen far down in the southern sky at a distance of about 170,000 light-years, this beautiful nebula measures more than 1000 light-years across and extends over more than one third of a degree, almost, but not quite the size of the full moon. It received its descriptive name because of the unusual shape. 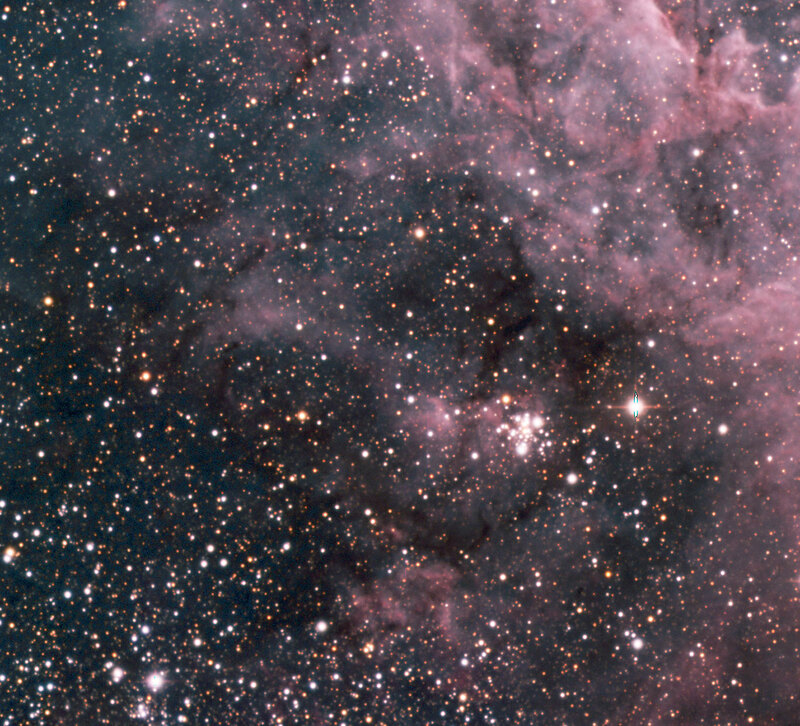 The largest emission nebula in the sky, the Tarantula Nebula (also known as NGC 2070 or 30 Doradus ) is located in the Large Magellanic Cloud (LMC) , one of the satellite galaxies to our own Milky Way system. Seen far down in the southern sky at a distance of about 170,000 light-years, this beautiful nebula measures more than 1000 light-years across and extends over more than one third of a degree, almost, but not quite the size of the full moon. It received its descriptive name because of the unusual shape. 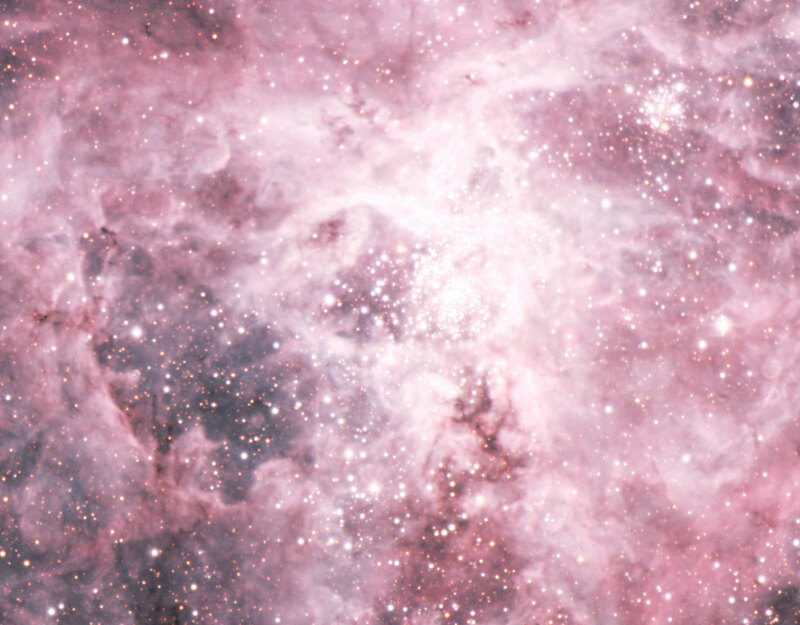 It is a splendid object with a central cluster of hot and luminous young stars that powers strong emission from hydrogen and oxygen gas, making the Tarantula Nebula an easy and impressive target for observations, even with the unaided eye. It is well visible from ESO's mountain observatories at La Silla and Paranal in Chile and it has been the object of innumerable research programmes with many different telescopes. 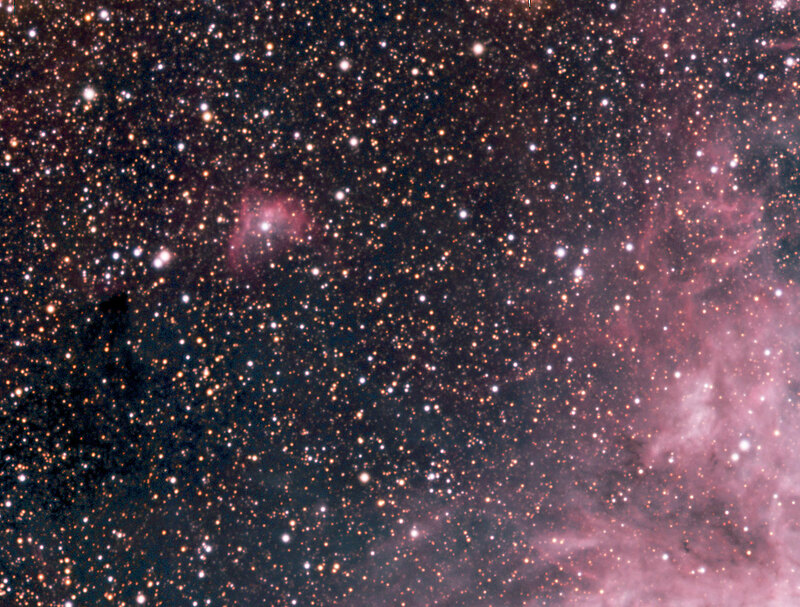 As the name indicates, the WFI has a comparatively large field-of-view, 34 x 34 arcmin 2, and it is therefore well suited to show the full extent of this stunning nebula. ESO Press Photo eso0216a has been produced from 15 individual WFI-exposures obtained in September 2000. Details are available below about the way it was made. A large number of different and colourful objects are seen in this amazing image. 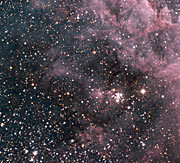 The very complex nebulosity is prominent in most of the field; it predominantly emits red light from hydrogen atoms (the H-alpha spectral line at wavelength 656.2 nm) and green-blue light from hydrogen atoms (H-beta line at 486.2 nm) and oxygen ions (two [O III] lines at 495.7 and 500.7 nm). 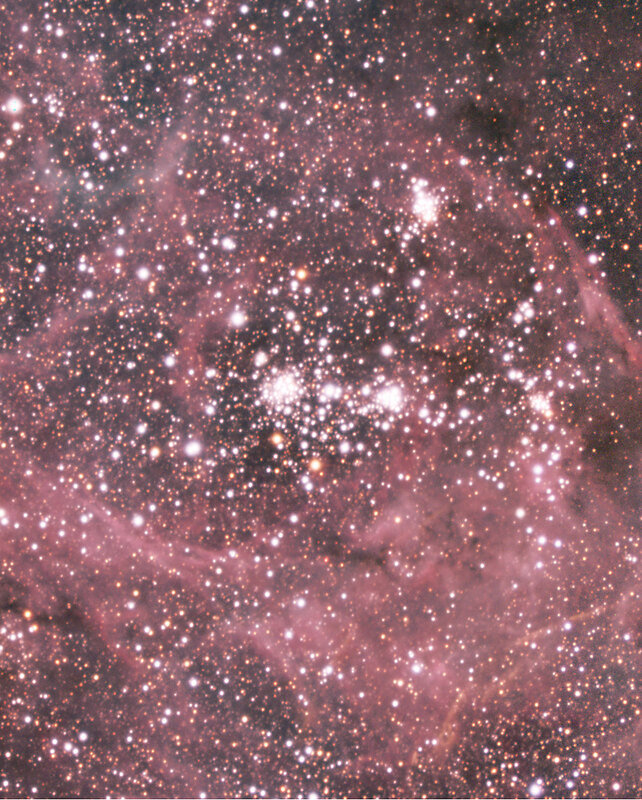 This emission is excited by the strong ultraviolet (UV) radiation emitted by hot young stars in the central cluster (known as "R136") which were born 2-3 million years ago at the heart of the Tarantula Nebula . 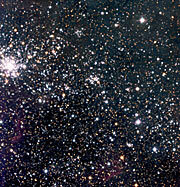 Throughout the field, there are several other smaller, young open stellar clusters that are still embedded in nebulosity. 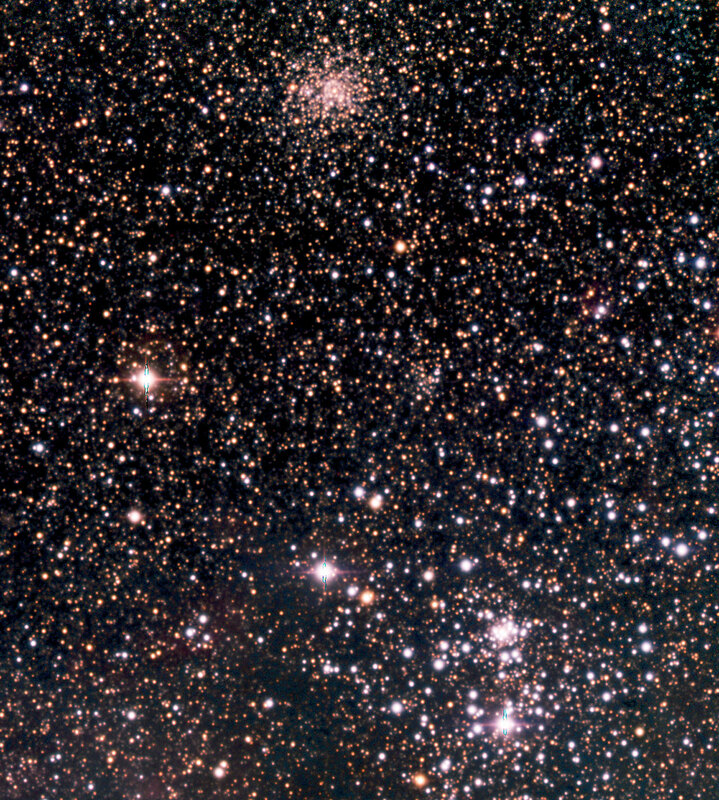 Two globular clusters can also be seen, NGC 2100 at the very left of the field-of-view (see ESO Press Photo eso0115 below), and KMHK 1137 at the upper right ( ESO Press Photo eso0124 ) . 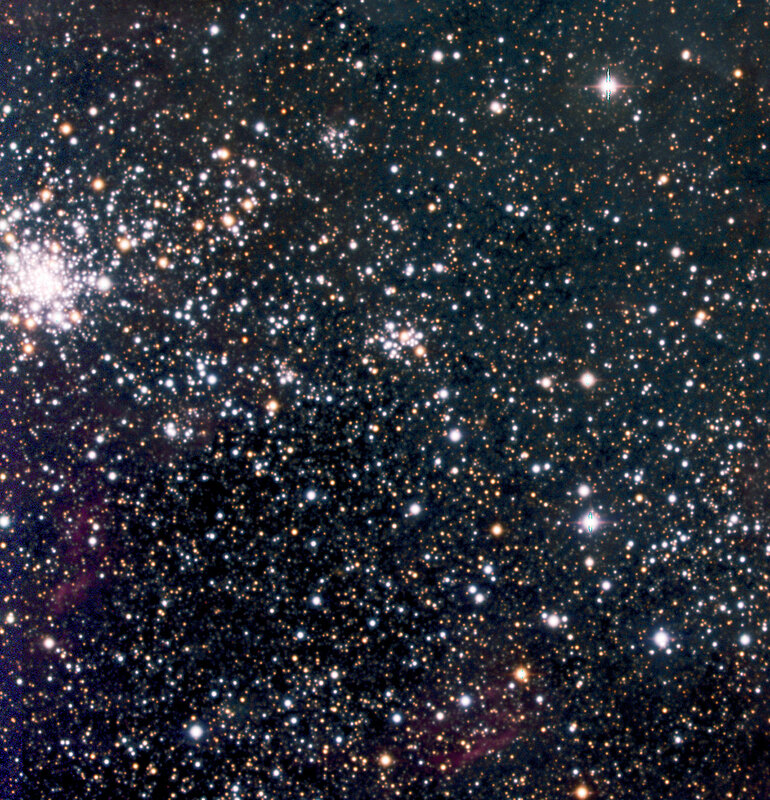 Note the very different colours of these two globular clusters: the stars in NGC 2100 appear blue and bright, indicating their relative youth, whereas those in KMHK 1137 are fainter and much redder, due to their older age and possibly also the reddening effect of dust in this area. The entire field is full of stars of very different colours and luminosity - most of them belong to the LMC, but some are foreground objects in our own galaxy, the Milky Way. Below are shown a number of typical objects and their immediate surroundings, all located in the field of the large WFI photo ( ESO Press Photo eso0216a ) and illustrating the great diversity present in this rich area. 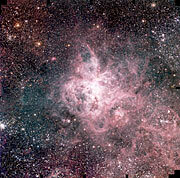 Earlier colour composite images of the Tarantula Nebula have been made with other instruments at ESO telescopes, e.g. PR Photo 03c/98 in near-IR with SOFI at the 3.5-m NTT on La Silla and PR Photo 05a/00 in visual light from FORS2 at the 8.2-m VLT KUEYEN on Paranal. "NGC" means "New General Catalogue" (of nebulae and clusters) that was published in 1888 by J.L.E. Dreyer in the "Memoirs of the Royal Astronomical Society". "KMHK" refers to a list of LMC clusters published in 1990 by M. Kontizas, D.H. Morgan, D. Hatzidimitriou and E. Kontizas (Astronomy and Astrophysics Suppl. Series, Vol. 84, p. 527). 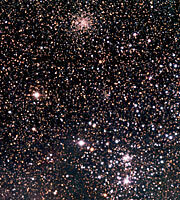 ESO Press Photo eso0216a was produced from 15 images that were obtained in September 2000 with the Wide-Field-Imager (WFI) at the 2.2-m MPG/ESO telescope. The images were exposed in the B-band (5 x 200 sec; wavelength 456 nm; Full-Width-Half-Maximum (FWHM) 99 nm; here rendered as blue), V-band (5 x 200 sec; 540 nm; 89 nm; green) and R-band (5 x 200 sec; 652 nm; 162 nm; red). The original pixel size is 0.238 arcsec. The photo shows the full field recorded in all three colours. It measures approximately 34 x 34 arcmin 2 ; North is up and East is left. The seeing was about 1.6 arcsec. ESO Press Photo eso0216a is an LRGB composite image, using a processing technique known as "Luminance Layering". The red, green and blue images were stacked for the Luminance (L) channel, yielding a black and white, high S/N-ratio image. In order to show details in the bright centre of the nebula as well as the much fainter outer filaments, a non-linear filtering technique known as "DDP" (cf. http://www.asahi-net.or.jp/~rt6k-okn/viewgrap.htm for more details) was applied to the Luminance image. In parallel, the three colour channels were combined in the usual way into an RGB colour image. The colour information from the latter image was then copied onto the Luminance image. ESO Press Photos eso0216b-g have all been extracted from ESO Press Photo eso0216a . The images were prepared by Mischa Schirmer at the Institut für Astrophysik und Extraterrestrische Forschung der Universität Bonn (IAEF) by means of a pipeline specialised for reduction of multiple CCD wide-field imaging camera data. The observations at La Silla were performed by Thomas Erben and Marco Lombardi (both IAEF Bonn).